In September 1997, when Britain was still intoxicated by the biggest general election landslide in the country’s history, the Labour Party spin doctor Derek Draper published a book, entitled ‘Blair’s 100 Days.’ A self-styled insider’s account, Draper’s book was supposed to capture the mood of elation and change after 18 years of Conservative Party rule, although the significance of 100 days – when governments take many years to bring discernible change – was never really captured. It was, remembered the Labour Party grandee, Roy Hattersley, ‘a truly dreadful book.’ The Guardian described it as a hagiography. But still we don’t learn from the irrelevance of the landmark and politicians retain their hundred day itch. In February, when he launched his FIFA presidential campaign at London’s Wembley Stadium, Gianni Infantino practically invited scrutiny on this so-called landmark – which falls this Sunday (5 June) – following 18 years of Blatter, when he unveiled 11 pledges that would be achieved in his first 90 days. Unlike a proper government – on which FIFA under Blatter sometimes fashioned itself – a sports governing body should be nimbler and more capable of exacting meaningful change in a shorter timeframe. Indeed wide ranging governance reforms were passed shortly before the vote on the new leader. 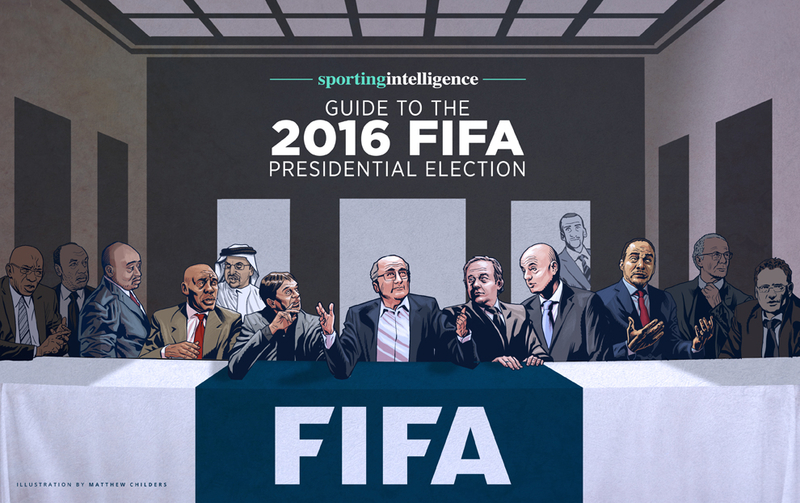 But notwithstanding those reforms, what has really changed in football’s world governing body? Frankly very little. A FIFA organisation that briefly advocated change as it clung onto its survival under the caretaker Issa Hayatou has regressed. Before the election we were told that if reform was not forthcoming then the Swiss authorities would consider FIFA incapable of change from within and in the context of its investigations would re-designate it from being a victim to a criminal enterprise. In such circumstances they may even dismantle the entire organisation. Those governance reforms were seen through in February, but have already come under hasty attack from the new president. Transparency promised throughout a campaign this website covered and analysed in depth as it unfolded, has not happened. A clumsiness and cynicism pervades that even the artful Blatter would have dodged. If what the world was warned about the Swiss legal threat was true, then 100 days into his reign, Infantino is treading a fine line on FIFA’s future. First there was the botched appointment of new general secretary Fatma Samoura. From a PR perspective, a relatively young woman of sub-Saharan African descent from an NGO background draws a welcome contrast to the mostly white old men that have previously led and plundered FIFA. But the plaudits end there. The promised transparency in the recruitment process never materialized. The appointee was supposed to come from an international executive search, but the job was never advertised and no one seemed to know anything about Samoura – who is meant to have more far reaching executive powers than the purportedly ceremonial president – until her appointment was announced. Who frankly knows what sort of GS she will turn out to be, for she has no football track record. But a cynic might say Infantino has chosen someone who ticks certain boxes and yet owes all her loyalty and authority – and de facto subservience – to him. If Samoura’s appointment was a clumsy breach of the new FIFA protocol, what else transpired at the Mexico Congress was simply outrageous. Late and skilful political manoeuvering by the President’s men saw FIFA Congress revoke the independence of various committees. These were institutional safeguards that even Blatter saw the merit in (until, of course, they banned him) and were seemingly sacrosanct to FIFA’s future as a credible body. The apparent reason for Infantino to undermine the governance of his own organisation was even the most risible aspect: a dispute over his own salary with the chairman of the audit and compliance committee, Domenico Scala. It seems Infantino found the prospect of a $2million base salary ‘insulting’ and so sought to rid himself of Scala who held the purse strings. 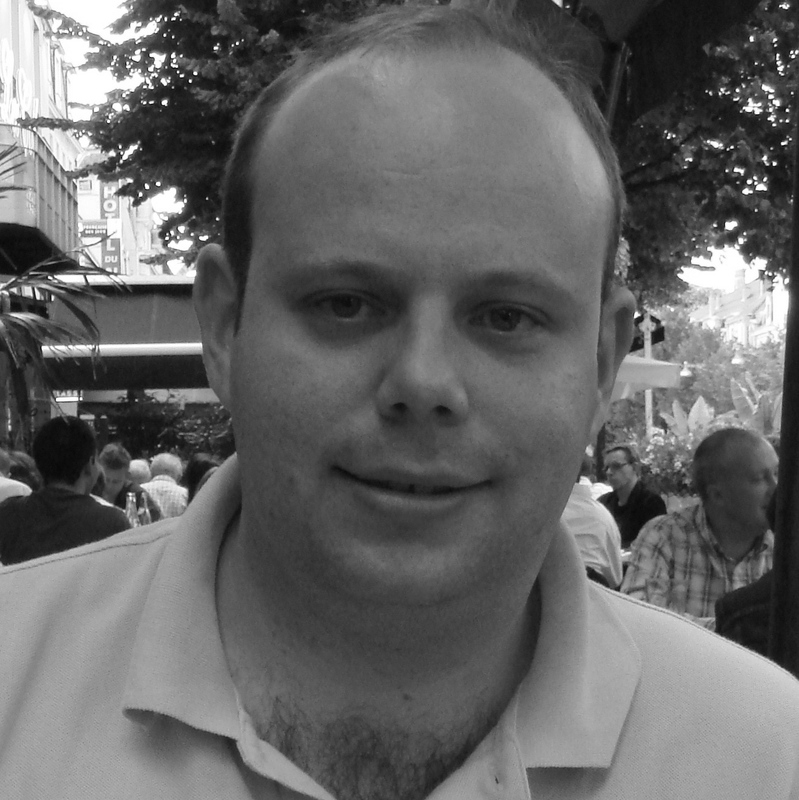 Scala, who resigned over the dispute, should not be mourned too much, for he too was someone well versed in the old FIFA ways: obfuscation and lack of transparency (although not as far as we know naked greed). Yet at the heart of the dispute were the core issues that have gripped and undermined FIFA for decades: Machiavellinism and self interest as well as lies and PR manipulation. 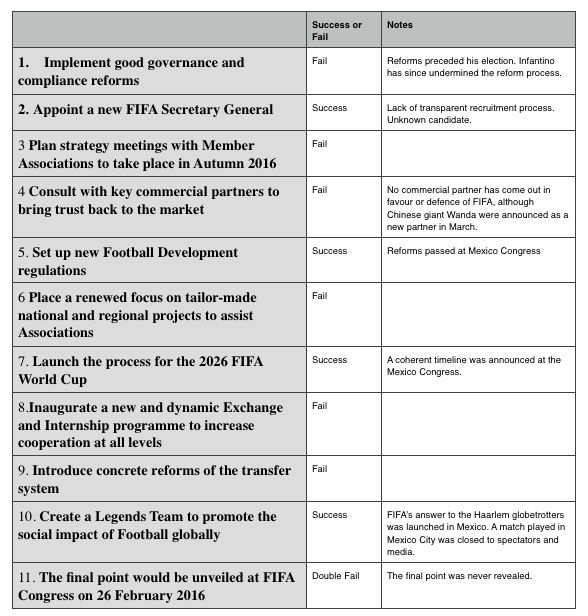 Infantino pledged in his own manifesto: ‘I will bring genuine Reforms and Good Governance to FIFA’s structures leading by example at the head of the organization.’ So far this has been a colossal fail, but may have greater implications. Having been accused of ordering the destruction of FIFA Council meeting documentation he may find himself going the same way as his predecessor. 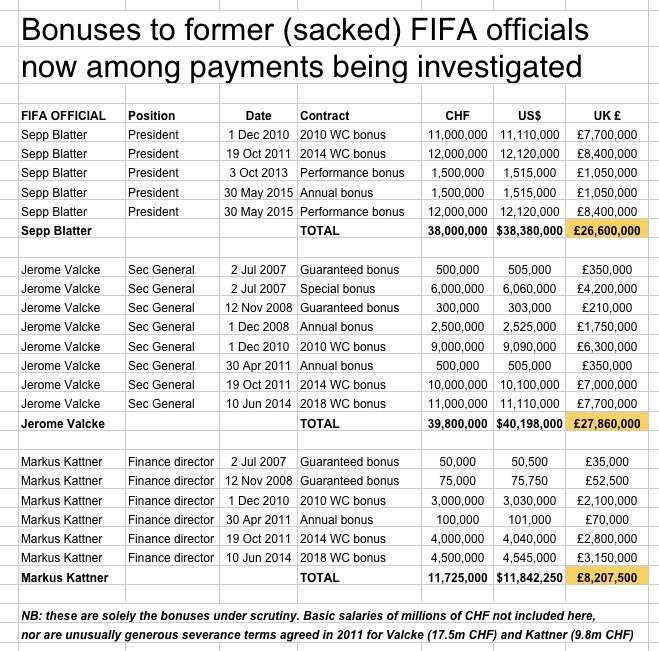 Fortunately for Infantino at the summit of this crisis a new one erupted, involving enormous bonuses the previous FIFA president and his management team had awarded themselves. (Detail right, click to enlarge). Quite how this information only came to light now remains to be seen. Perhaps Infantino’s administration hasn’t forgotten all of Blatter’s array of diversionary tricks. Maybe the warning signs should have been there from the start. Infantino had run a very smart electoral campaign, building an inexorable momentum as we entered the final weeks. Some of his pledges were good. And yet after his victory, the Swiss only gave 14 minutes of his carefully stage-managed time at the post election press conference, blaming emotion and fatigue for his brevity. A similarly choreographed press conference at Wembley had seen an ‘awkward squad’ of journalists sidestepped until one forcefully got his question about Greek match-fixing in amidst all the platitudes about legends teams and fresh starts. Faced with a hard-hitting question on his own track record, Infantino palpably stumbled. That February afternoon, Infantino had given 11 pledges that he would fulfil in 90 days. 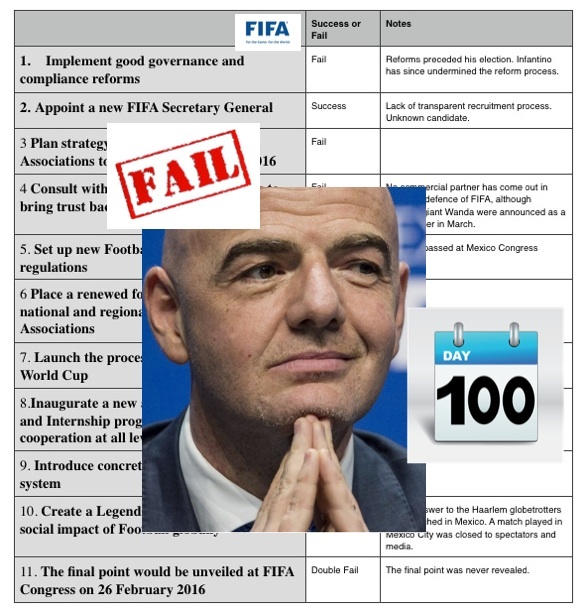 Whether other promises, like the quadrupling of development money, are fulfilled and within budget, we will judge in the long term – if indeed FIFA actually lasts that long – but for now we will assess Infantino on his own short term promises. The results, alas, are deeply underwhelming, as our report card below describes. That 100-day itch may yet develop into a sore.